This beloved children’s classic—about a girl and her younger brother who run away to New York City, live in the Metropolitan Museum of Art, and try to solve the mystery of who sculpted its newest statue—is a staple of elementary school reading lists. Here are a few things you might not have known about it. A kernel of the idea for The Mixed-Up Files of Mrs. Basil E. Frankweiler began with a piece of popcorn on a chair. Konigsburg wrote later that she was visiting the Met with her three children, going through the period rooms on the museum’s first floor “when I spotted a single piece of popcorn on the seat of a blue silk chair. There was a velvet rope across the doorway of the room. How had that lonely piece of popcorn arrived on the seat of that blue silk chair? Had someone sneaked in one night—it could not have happened during the day—slipped behind the barrier, sat in that chair, and snacked on popcorn? For a long time after leaving the museum that day, I thought about that piece of popcorn on the blue silk chair and how it got there." 3. … AND A PICNIC WITH HER KIDS. They could hide there if they found a way to escape the guards and left no traces—no popcorn on chairs—no traces at all. The Museum had everything. … And while they were there—while they were ‘insiders’ in every sense of the word—they could discover the secret of the mysterious statue that the Museum had bought for $225. And then, I thought, while away from home, they could also learn a much more important secret: how to be different inside their suburban crust—that is, different on the inside, where it counts. 4. KONIGSBURG DREW THE ILLUSTRATIONS—AND HER KIDS POSED FOR THE CHARACTERS. 5. SHE AND THE KIDS MADE MANY RESEARCH TRIPS TO THE MUSEUM. 6. 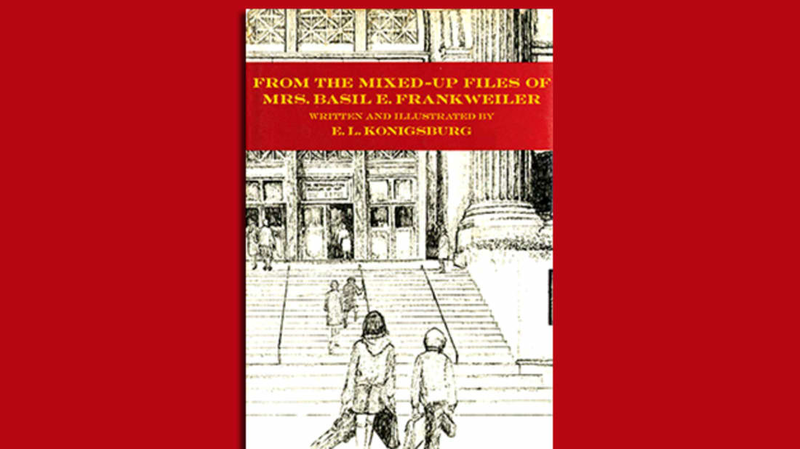 MRS. FRANKWEILER WAS BASED ON TWO WOMEN. Since you came in with FROM THE MIXED-UP FILES OF MRS. BASIL E. FRANKWEILER, I have found myself chuckling over it more than once. I have read it myself only once, but the memory of the incidents comes up every once in awhile. I really do want this book. I will be sending you a contract very shortly. I have some suggestions that I think will make it even better, but don’t want to make them until I have had a chance to read it through again. You will be hearing from me shortly. 8. THE BOOK WON A NEWBERY AWARD. I liked when Claudia wanted to be a heroine. ... I thought that was only a drug. But now I know it means a girl hero. 10. … AND A READER DIDN’T THINK ONE PART OF THE PLOT WAS REALISTIC. 11. ONE PUBLISHER WANTED TO ADAPT SOME OF FROM THE Mixed-Up Files FOR A TEXTBOOK—BUT IT DIDN’T WORK OUT. You will be interested to know that since you will not allow the children not to stand on the toilets [the publisher] has decided not to use the selection. I think they are being absurd and hope it doesn’t bother you too much that they won’t be using it. 12. THERE WAS A SEQUEL … OF SORTS. When Mixed-Up Files won the Newbery in 1968, Konigsberg wrote a mini-sequel to hand out to the attendees of the banquet. In it, Jamie is writing a letter (in pencil, to Claudia’s horror, because he’s renting his pen to Bruce) and tells Claudia that he’s writing to Mrs. Frankweiler because she put everything they told her “into a book, and it won the Newbery Medal. … I figure that if the medal is gold, she better cut me in. I’ve been broke ever since we left her place,” he says. 13. IT WAS MADE INTO A MOVIE. Two movies, actually. The 1973 big-screen adaptation starred Ingrid Bergman as Mrs. Basil E. Frankweiler; Sally Prager played Claudia, and Johnny Doran played Jamie. According to a New York Times article about the movie, the Met, which closed for a day to accommodate filming, had “never before given over its premises to a commercial film.” (The title was called The Hideaways for home video.) The book was also adapted in a TV movie in 1995, with Lauren Bacall playing Mrs. Frankweiler. The bed that Claudia and Jamie slept in—where Amy Robsart, wife of Elizabeth I’s favorite, Lord Robert Dudley, was allegedly murdered in 1560—has been dismantled, and the Fountain of Muses, where the kids bathed, is no longer on display. The chapel where Jamie and Claudia said their prayers was closed in 2001. The museum’s entrance has been given a facelift, and it’s no longer free to get in as it was when Jamie and Claudia stayed there (although admission is donation-based). 15. … BUT ITS STAFF STILL GETS ASKED LOTS OF QUESTIONS ABOUT THE BOOK. In fact, it gets so many questions that it created a special issue of Museum Kids entirely devoted to Mixed-Up Files [PDF]. After making it very clear that kids can’t camp out in the Met like Jamie and Claudia did, the issue guides kids to spots featured in the book—including the Egyptian galleries—and the Room from the Hotel de Varengeville in Paris, where Konigsburg saw the piece of popcorn on the blue silk chair. 16. THE MUSEUM DOESN’T ACTUALLY OWN A STATUE BY MICHELANGELO. 17. AND THE MYSTERY OF ITS BARGAIN SCULPTURE HAS BEEN SOLVED. The Met’s bargain sculpture was made of plaster with a stucco surface; it is believed to be a cast of one of Verrocchio’s sculptures, The Lady with the Primroses. Curators think it was made by Leonardo da Vinci around 1475, when he was working in Verrocchio’s workshop [PDF].